Almost everyone who knows him finds it hard to associate him with the words “illegal”, “crime” and “arrest”. 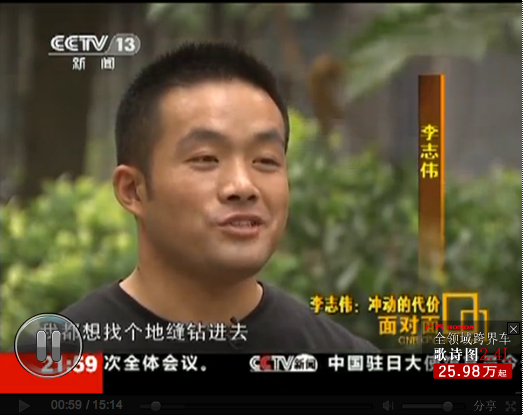 In his security guard job in Shenzhen he worked hard, and in only six months was promoted to team captain. When he finished work he hurried off to do volunteer work, still wearing his uniform. 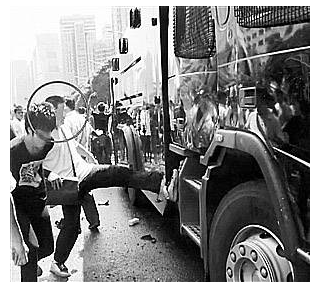 But in the baodiao [protect-Diaoyu] marches in Shenzhen on September 16 this young man, who often dons the red volunteer’s vest, displayed a violent side when he participated in car-smashing. The vehicle he smashed was a riot van parked in front of gates of the Shenzhen Municipal Party Committee. Seven days later, the police published his headshot along with those of 19 other participants. The photographs occupied the entire front page of the local Jing Bao paper. He understood as soon as saw it, and took himself straight to the police station, where he was detained for the crime of troublemaking. The police have not revealed his real name, calling him instead Li X. Among all the wanted smashing suspects, Li was the first to surrender. After two days in detention, the leader of his security team organized for him to be released on bail. “He is very warm-hearted, and values loyalty,” said the person in charge at the volunteer services station, who could not believe Li had become a wanted criminal. This person remembered the first time Li came to the volunteer station; he went rushing about here and there, and had soon fixed a faulty fluorescent tube. On the morning of September 16, however, he had not put on his navy-blue uniform as usual. He had asked to stay in the dormitory because of a bout of gastro. But before long, he was leaving the dorm, and riding the subway to Huaqiangbei station. He had heard from a co-worker that those participating in the baodiao march were gathering there. The human sea outside the subway station was a stunning sight. Most of the people on the street were of a similar age to him, and were carrying hand-written or printed banners, thrashing their voice boxes shouting slogans. Without hesitation, he joined the crowd. Li was born in a village in Zhoukou, Henan Province. The family was poor, with his mother only able to earn 20 yuan a month as a substitute teacher, while his father tilled their 4 mu of land [about 2500 sq m]. In his second year of junior high school, as the eldest child, he quit school and went to find work. In the past 10 years he has passed through Shanxi, Beijing, Tianjin, Shenzhen and other places. He has worked in garages, eateries, and on the assembly line in an electronics factory. In his own words, he has always been doing “the lowest level of work in this society”. 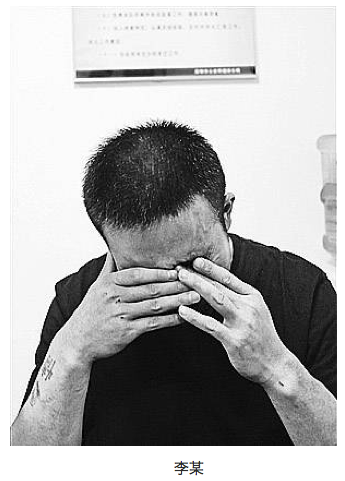 “No matter how other people see me, I often look down on myself,” the 29-year-old told China Youth Daily, his eyes darting about evasively as he sat on a wooden stool on a Shenzhen sidewalk. He had “no concept” of protest marches. That day on Shenzhen’s wide streets, he initially felt a bit awkward. “I couldn’t open my mouth to yell the slogans,” he said. After quite a while listening to others’ chanting, he slowly caught up. “Tedious” is the word he uses most when assessing his day-to-day existence. He often couldn’t stand hanging around in his 6-person dormitory, and in his spare time would often “wander around the streets aimlessly”. On May 1 this year, he was on one of these walks when he came across a stall recruiting volunteers. He asked whether outsiders [ie. those without official Shenzhen residency status] could register. When the answer came back in the affirmative, he immediately joined. During the Dragon Boat Festival, he wrapped dumplings for the elderly. On weekends he went to the [Hong Kong] border post, helping maintain order, giving directions to travellers and carrying their luggage. He said participating in these activities gave him a feeling of “pure happiness”, making his life “not so boring”. Walking the streets of Shenzhen that day in the midst of thousands upon thousands of strangers, gave him a feeling of excitement he had never felt before. Before long he was shouting slogans “more and more enthusiastically”. BOYCOTT JAPANESE GOODS! DOWN WITH THE JAPANESE! RECOVER THE DIAOYU ISLANDS! Now he was roaring with the energy of his entire body. A short while later he summoned up the courage to lead the whole crowd through several rounds of slogans. The ranks of the crowd grew ever-larger, as more groups converged from different directions on the 6-lane Shennan Avenue. Li moved to the very front of the crowd, raising a giant flag with 30 others whom he’d never met. At each crossroads they sang the national anthem. He hadn’t sung the national anthem since leaving school. “I had even forgotten the words.” But after a few renditions, this tone-deaf man was completely unleashed, and he sang louder each time. “I felt my patriotic passions being aroused,” he remembered. In that moment he felt “quite carefree”. Ordinarily, “life seems quite pointless”, he said. “I am nearly 30 years old and unmarried, I have no skills. You could say that I have nothing in this world.” He let out a sigh as he said this, and then fell silent. Last summer he ended a failed marriage. In his village, divorce is a “very humiliating thing”. When he went home for Spring Festival this year, he barely went outside the house, and on the third day of the new year he returned to Shenzhen. He said he likes this “young, energetic” working city. His phone’s background picture is a photograph of himself in front of a Deng Xiaoping propaganda poster. On the day of the protests, Shenzhen’s streets made this young man dizzy with excitement. His brain was blank; its only thought was “quickly recovering the Diaoyu Islands”. “If there is a war, I am willing to be cannon fodder!” he told himself. The imagined war never came. Instead, there was a mass riot. People charged at a riot van; some booted it with their feet, others climbed onto the roof and started wrenching at its water hose. Li followed, charging forward. He kicked wildly at the riot van for a while, but could see “no effect at all”, so he picked up a wooden plank about 1 metre long and tried to lever the van’s door open. The heavy vehicle didn’t move. So he wound up and swung the plank wildly at the van’s rear-vision mirror. With a crash, the mirror lay in pieces. In that crazy mob, he never realized what his actions meant. Leaving the plank behind, he rejoined the marchers. Even further from his mind was the CCTV camera above the road, recording his every move. In time, the police would capture his image and publicise it throughout the whole city. He was wearing a yellow T-shirt and a ferocious expression. He was unwilling to recount these memories to the journalist. “I am really under a lot of pressure.” As soon as the car-smashing was mentioned, his eyes turned red and he clutched his nose, only holding back tears with the most extreme effort. He unceasingly repeated, “I had never done an illegal thing in my life,” and that his actions were “a moment of impulse”. In his everyday life, this wandering worker is extremely rarely impulsive. In his sentry post, he has never broken the “no listening to music, no reading books, no using phones” rule. “I didn’t want the boss to think badly of me,” he said. Over his years away from home, this well-behaved man has always felt “the burden on my shoulders is very heavy”. He sends money home at regular intervals, sometimes a few hundred, sometimes a few thousand, but the situation at home has seen no obvious improvement. The single-story brick-and-tile house remains bare. His younger brother contracted a debilitating spinal inflammation [ankylosing myelitis]. This year, to earn a bit more money, his father left the land to find work in Zhengzhou, and his mother is working in Shenzhen as a waitress in a small restaurant. In his mother’s eyes Li is “very filial”. When she arrived in Shenzhen her son bought her a pair of sneakers and took her to the beach and the Window to the World theme park. The theme park’s entry price was too expensive, so the mother and son didn’t actually go in. Instead, they took photos outside the front gate. He told this story to his mother and the volunteer group leader. To this day the volunteer centre workers frequently bring it up to praise him. But when it comes to the future, Li still feels very uncertain. He longs to get married again; his QQ signature reads, “Always seeking true love! Who knows when I can find my ‘she’?” But as he often hears his colleagues say, in this metropolis of realism, “Chasing girls is always something you do with money.” Every day, in his sentry post, he often sees “40- or 50-year-old men with blossoming young girls in tow.” On his salary of RMB 2,300 a month, he has never dared to look for a partner. Marching on that broad avenue, it was as if he had no worries at all. As he waved the flag he had bought from the local stationery market, he saw a group of youths flinging glass bottles at a ramen noodle shop. When some police arrived to put a stop to it, the scene was one of total chaos. 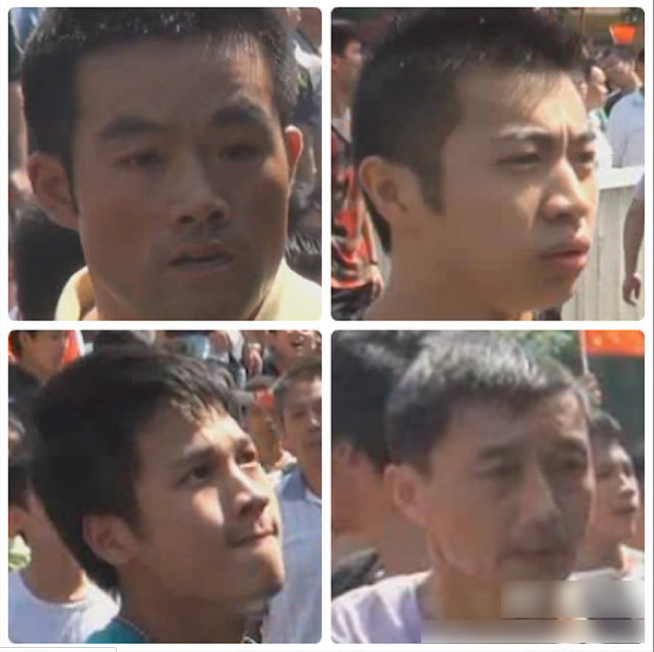 Li was taken to the police station with the bottle-throwers. When recording his statement he did not mention he had smashed a car. He returned to his dormitory that evening with a sore throat, his body aching all over, and fell asleep as soon as his head hit the pillow. At that point he was unclear as to why he had been taken to the police station for participating in a “patriotic demonstration”. Only when he saw the police had published his photograph in the newspaper as a wanted man, “a suspect in the destruction of public property”, did he suddenly realize the whole city now knew him as a “criminal element”. He skipped breakfast and went straight to the police station to turn himself in. In the detention centre he felt like time had stopped. He asked every person who was brought in: “How long until someone in my situation gets out of here? What will I be charged with? How long will I get?” He worries that his life would have a “stain left on it” from this point on. Before he left home to find work, the 15-year-old Li’s greatest dream was to be a soldier. But because his “family had no connections”, this could not happen. Later, he went especially to experience People’s Militia training. At the end of the course, all the recruits took rifles to practice shooting. “That feeling was so good, valiant, spirited!” As he sat on his wooden stool recounting this to the reporter, his eyes sparkled in the dim light. In this training course he won an “Outstanding People’s Militia Certificate”. That piece of tissue paper still remains in his room in his home village.